When we left off yesterday, Mary was staying with Elizabeth…for a three month stay. Since Gabriel showed up when Elizabeth was 6 month’s pregnant (Luke 1:26), I believe Mary was there when the next good news arrived in the Advent story- the birth of John. Why do I consider this good news? 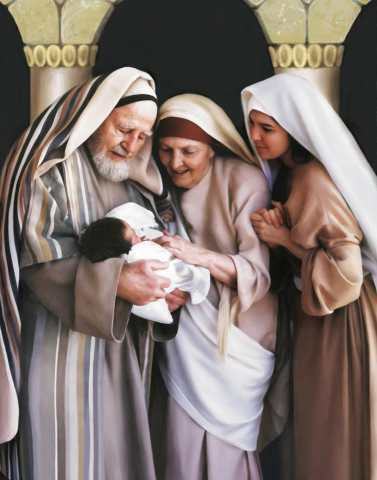 1) John was a visible reminder of the promise God birthed in Zachariah & Elizabeth- that they would have a son. 2) As herald for the Messiah, it would make sense that his arrival would strengthen Mary’s need to know God was in the business of keeping His promises. 3) A baby is always a blessing sent from God. New life is to be celebrated. A baby to a childless couple after years of waiting would be a major community event! As a cousin, it would make sense for Mary to be there for John’s birth, especially after hearing her cousin’s miraculous story, which closely lines up with her own. Her neighbors and relatives, seeing that God has overwhelmed (Elizabeth) with mercy, celebrated with her. Overwhelmed with mercy by God. The fulfillment of the promise God gave them. They would have a son. But as with every part of this fascinating true story, there is yet another twist entering the action. On the eighth day, the traditional day of circumcision & naming, the crowd began to call the baby after his father, Zachariah. A normal and honoring tradition, I am sure Zachariah, already moved by the whole scenario, loved hearing it. Any father who had waited so long to have a son would have too. Yet Elizabeth spoke up and proclaimed, as they were told by the angel, the baby was to be named John. They decided to use sign language to communicate with an unable to speak Zachariah! People, he was dumbfounded into not being able to speak, NOT DEAF. I am sure Zachariah was inwardly rolling his eyes or fuming, because I know I would be, but he determinedly grabs a tablet and writes out “His name is John” for all to see. Still reeling from the shock of the name of choice not being the father’s name, imagine the crowd’s reaction when Zachariah suddenly regains his speech, and begins by praising God! This promise became full blown news that night! And Mary? Mary soon after returned back home. I suspect her mother or aunt was also likely at John’s birth, due to the wonder of the event. An aged couple passed their prime gives birth. The last time that happened, it was to the forerunners of God’s people, Abraham & Sarah. And Israel came to be, born in the promise of Isaac. This time, the miracle happened to the relatives of that family tree, Zachariah & Elizabeth. and John came to be, born to herald the promised Messiah! I can hardly wait for the story to continue on Saturday with the final direct major player of this exciting drama. But first, I am going to have a little fun tomorrow before we move on! Until then, let’s keep wondering anew at the wonder contained in the #AdventuresinAdvent we have read so far!